A milky light breaking through the cloud cover softening the hard landscape. High May grass, deceptively soft, hiding stones & spikey semi-desert plants. Bluey green greys, mauve hay seed-heads, bright photosynthesising May yellow-greens.The oak in this painting is an example of what is known in gardening as ‘specimen planting’ : where one species is palnted like an island alone in the sea, a solitary specimen in 360 degrees of surrounding emptiness. Except for in this case, here in this truffle wood, it wasn’t done for reasons of asethetic design but by the hand of the farmer, Monsueir Vincent, who is patiently restoring the oaks. Actually, there’s rows of young saplings hidden in the high grass but you couldn’t see them for ‘La Mouliné’, which is up to a metre high. Lawns in gardens are the empty spaces that act as a foil to show off the specimen & beds. 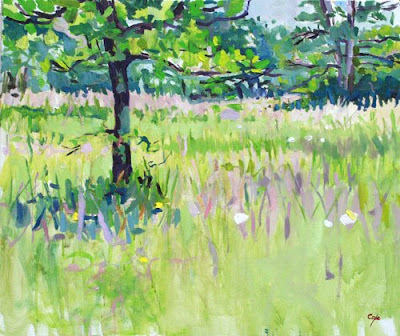 In terms of making a painting, it was a real effort to leave such a large ’empty space’ with not much going on, not many brushmarks… only the odd wild flower floating… the occassional slash suggesting the long grass….surprising how much restraint & pictorial discipline empty spaces takes. In this painting, I wanted a calm feeling. Meditative. Not a frenzy of brushmarks. The quiet I find in the deep countryside. Did I achieve it? You really did, Adam – beautiful sense of calm. I know what you mean about the discipline of empty space! Ravi que tu reviennes à Sarlat Adam, tu me donneras les dates et une affiche pour que je fasse la publicité. Merci. Cathy _ thanks for the feedback. One never really knows what a painting communicates to others, n’est pas?